Back in January it was "Alternative Facts." In June, it's COVFEFE. 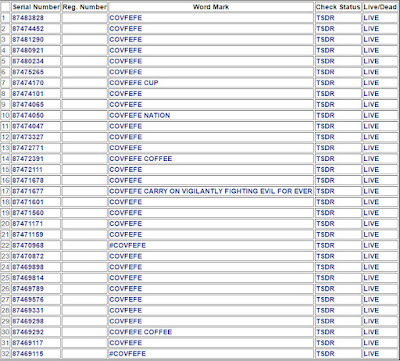 Since President Trump tweeted the strange word in the early morning hours of May 31st, 32 applications to register the word as a trademark have been filed with the U.S. Patent and Trademark Office. Sandwiches (Class 30) by the Seattle Biscuit Company, LLC. There are also several applications covering various clothing items in Class 25. Obviously, multiple applications for the same word covering the same goods and services will cause problems for most of these applicants because the USPTO will not register a mark that is confusingly similar to a mark contained in a previously filed application covering related goods or services. 15 USC 1052(d). Generally, the applicant that files first for particular goods and services is entitled to registration over later-filed applications. However, that assumes all the other statutory requirements for registration are met. See 15 USC 1052 for common refusals to registration. For example, generally, before a trademark application will mature into a registration, it must be in actual use as a trademark in interstate commerce (meaning the mark identifies the source of the applicant's goods/services and such goods/services are being sold, shipped, or, in the case of services, promoted or rendered across state lines). If an applicant cannot successfully demonstrate it is using COVFEFE as a trademark in commerce, or if there are any other deficiencies with the application (i.e., inadequate description of the goods/services, deficient specimen of use, incorrect classification of goods/services, etc.) the application will be abandoned and the non-refundable filing fees lost. 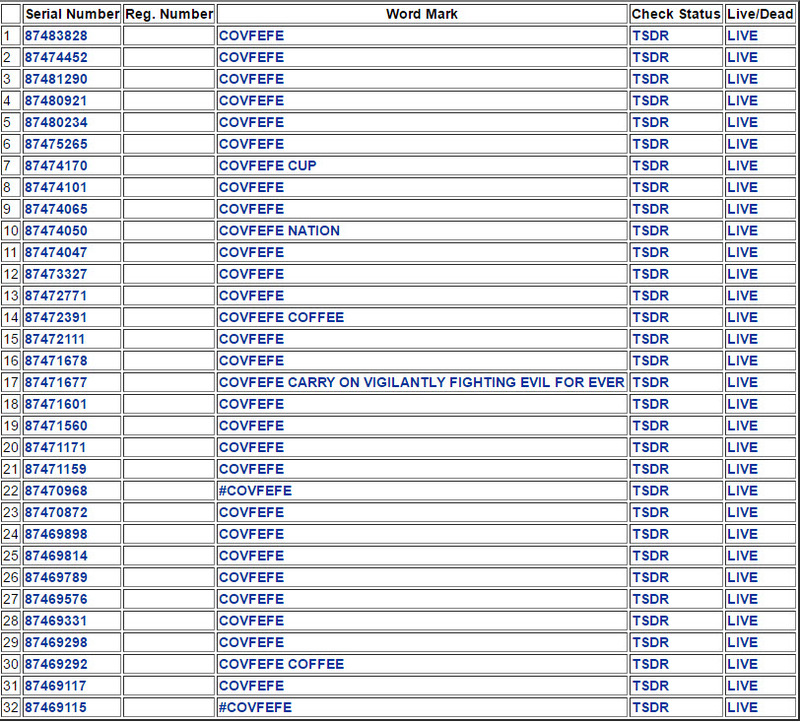 So, although 32 COVFEFE trademark applications have been filed through June 11th, and many more are likely to come, a very small number of these will actually register. Most will be refused registration due to earlier filed COVFEFE applications covering related goods/services, others will not submit sufficient proof of use, and other applicants will be denied due to various deficiencies in their applications. In other words, while it's relatively easy to file a federal trademark application, it is only the beginning of a complicated legal process and by no means guarantees an applicant a federal trademark registration.